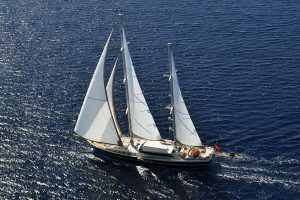 Have a question about Gulet Dolce Mare? 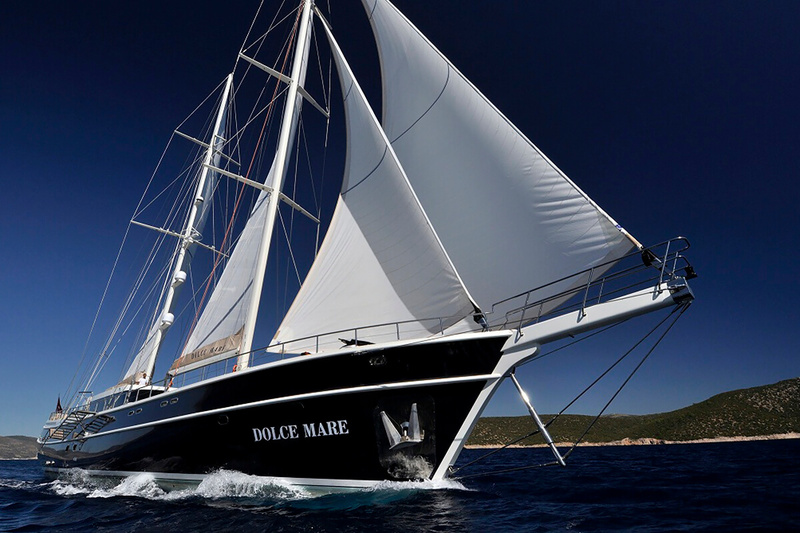 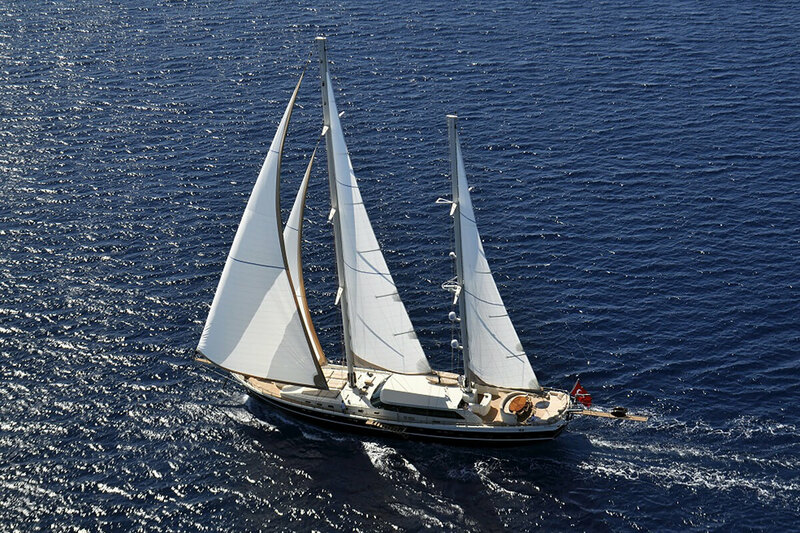 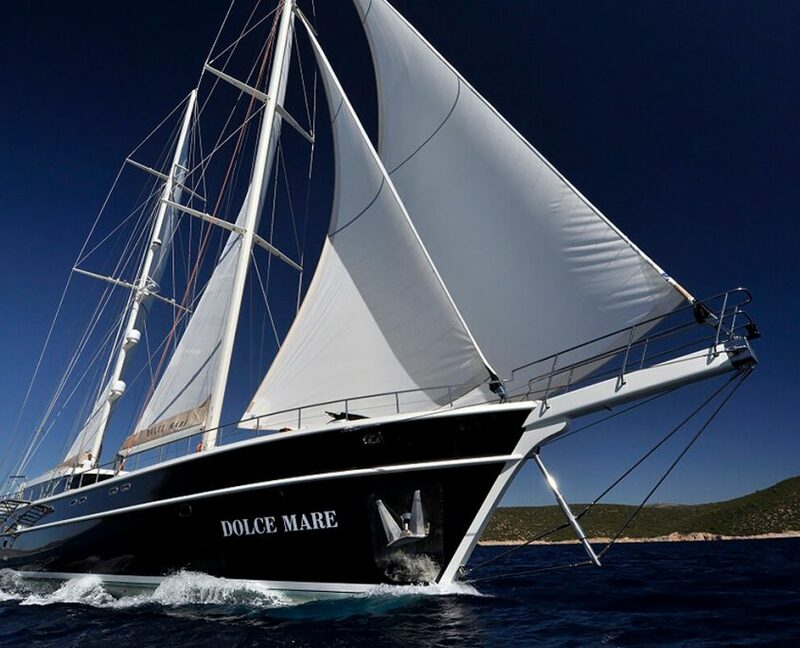 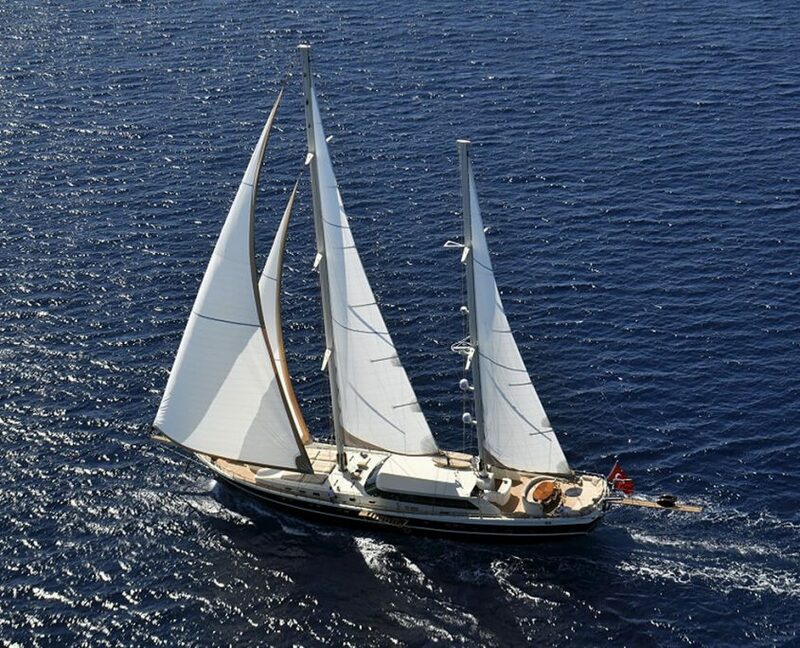 Dolce Mare is a luxurious gulet popular among many clients looking for a fine relaxing cruise. 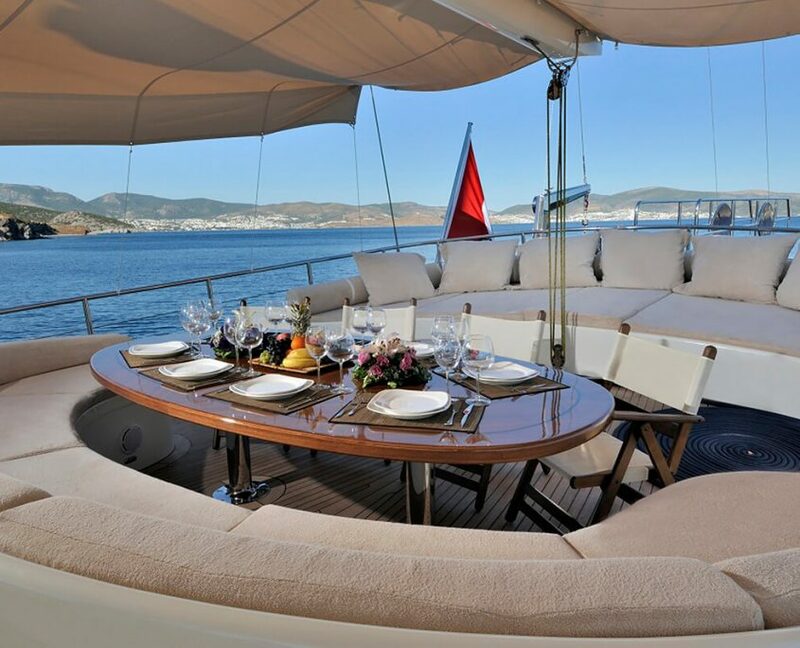 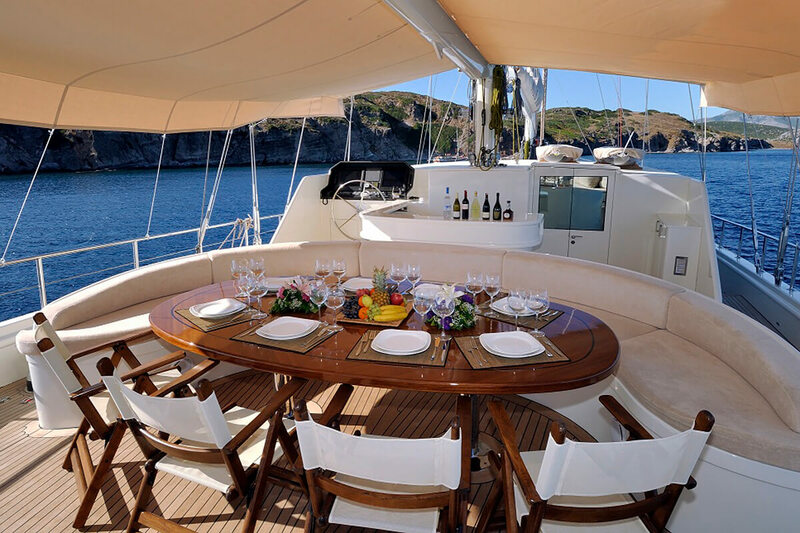 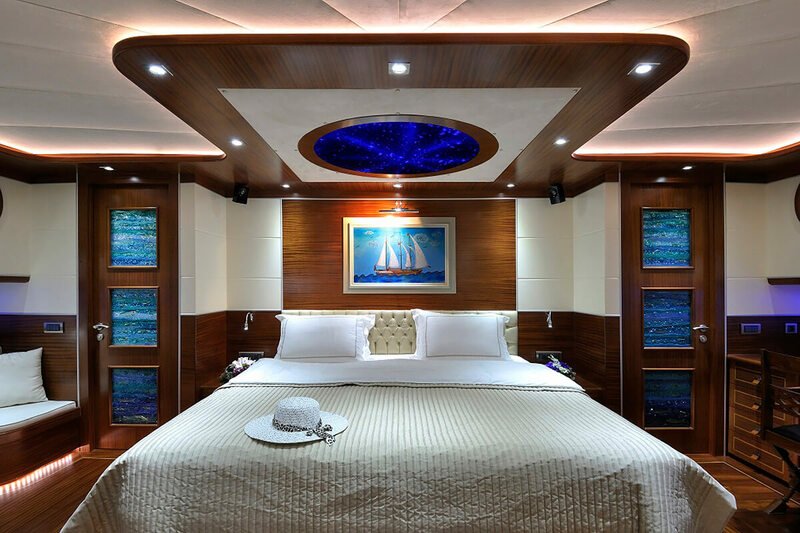 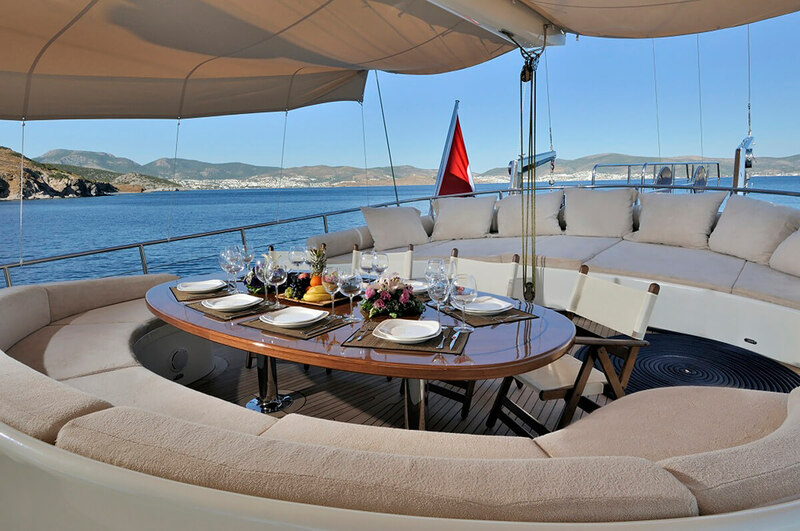 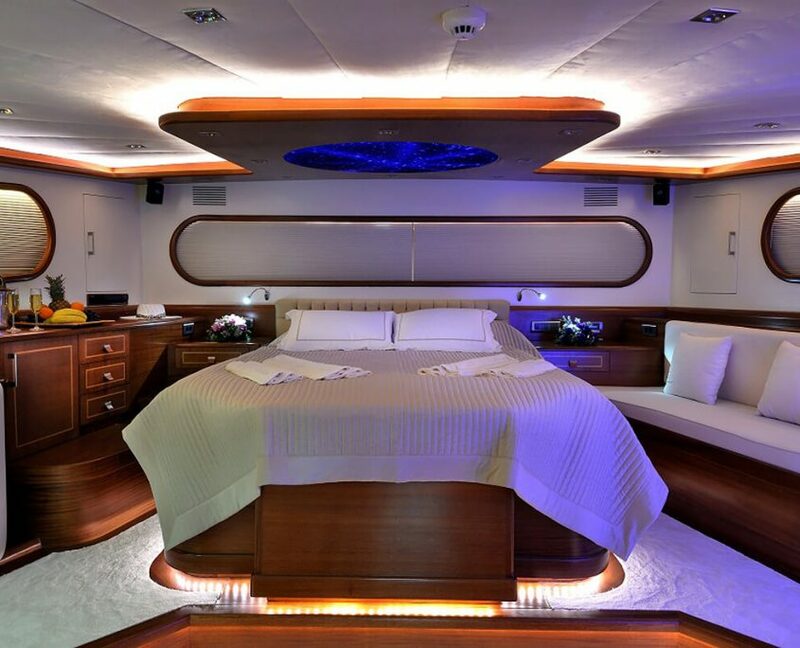 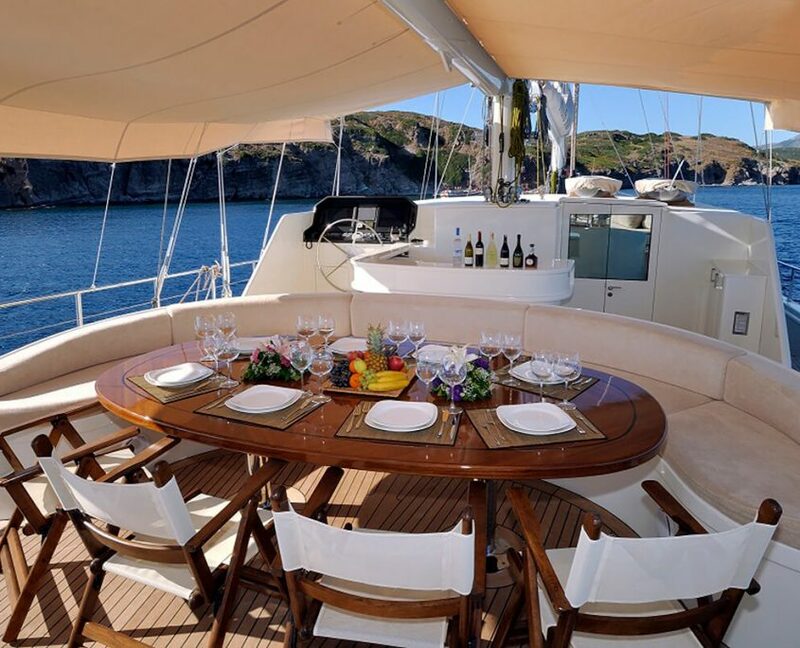 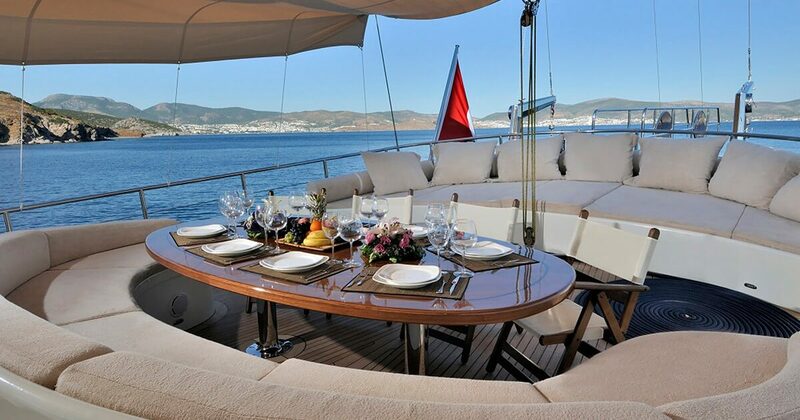 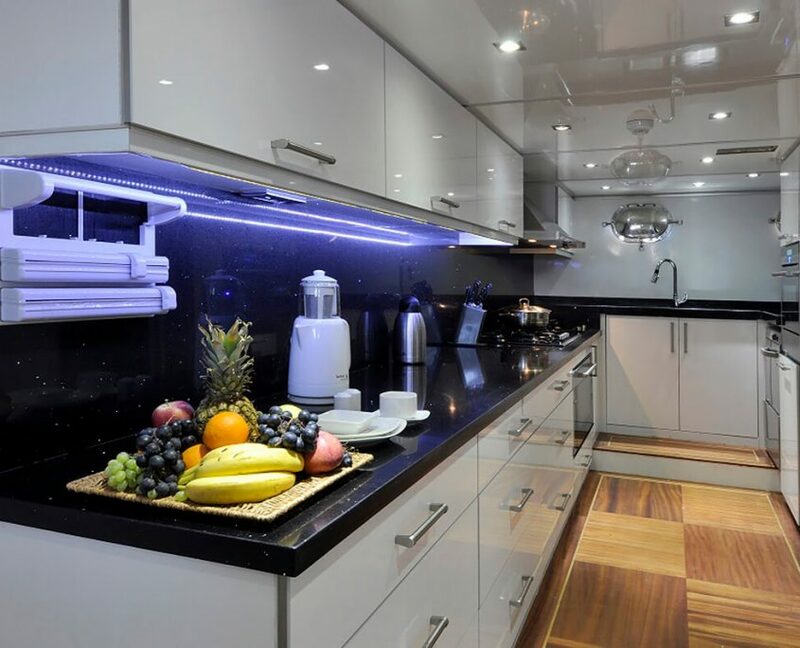 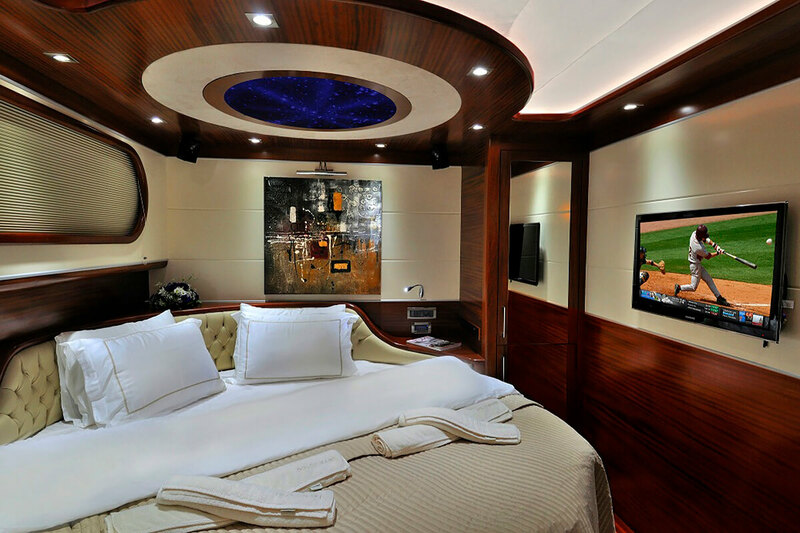 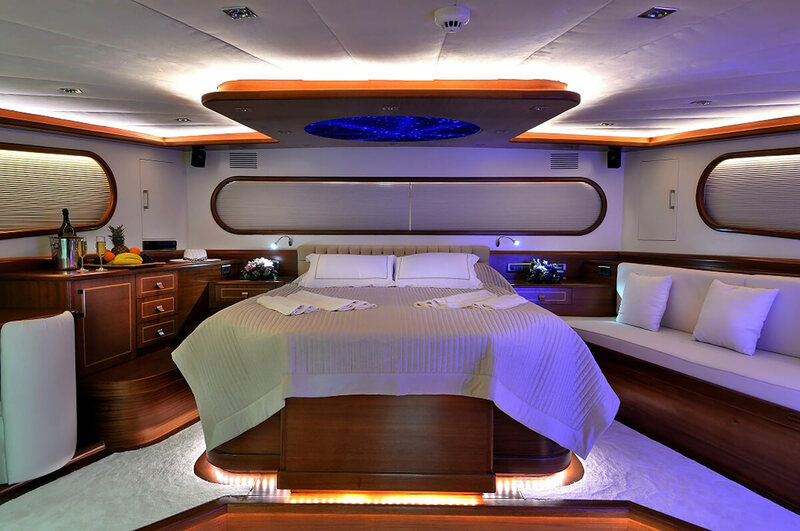 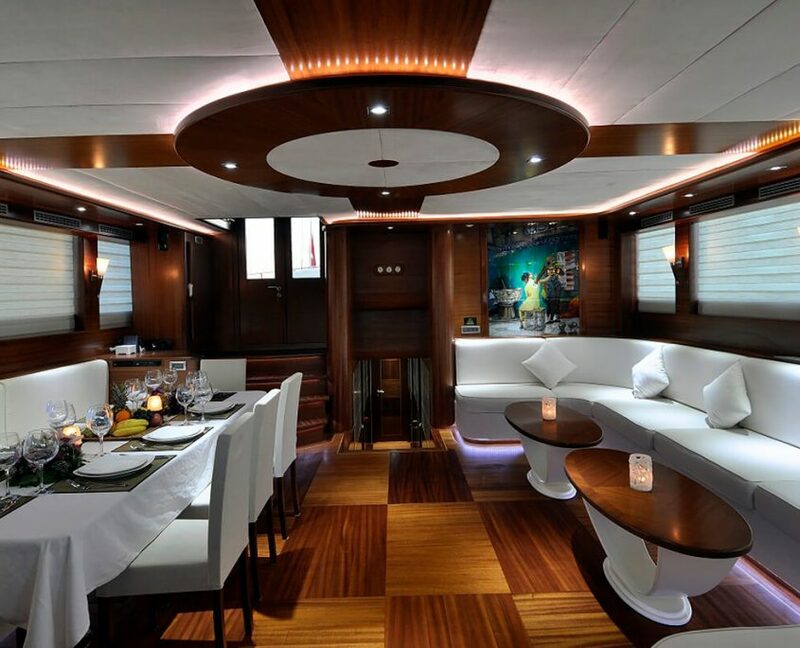 Beautifully designed exterior and interior provide comfort for 12 guests on board. 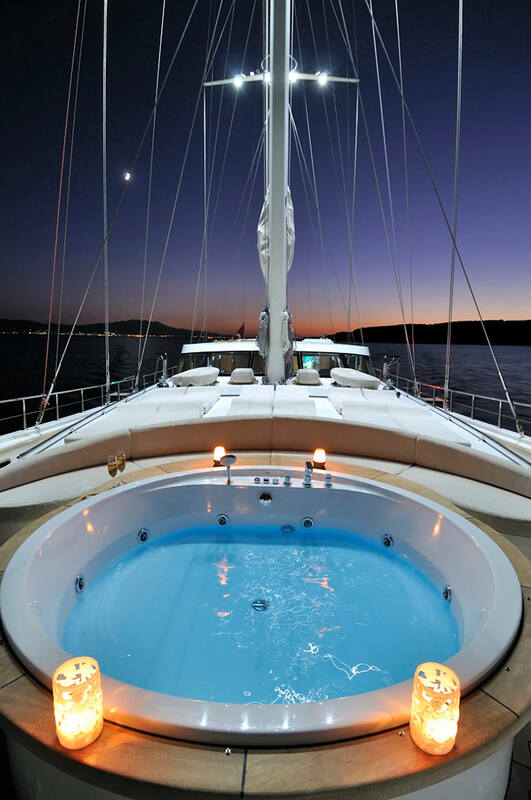 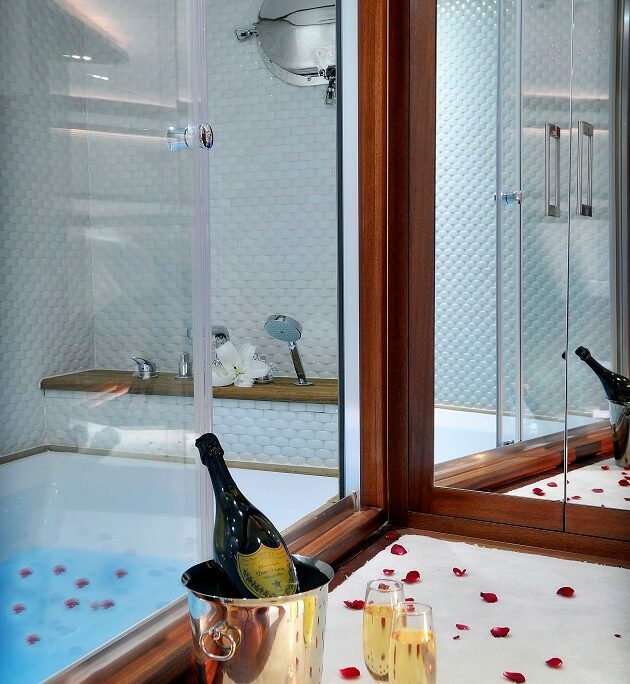 On deck, you’ll find spacious lounges, jacuzzi, water toys, a jet ski on request and sun cushions ideal for relaxing and enjoying during the cruise. 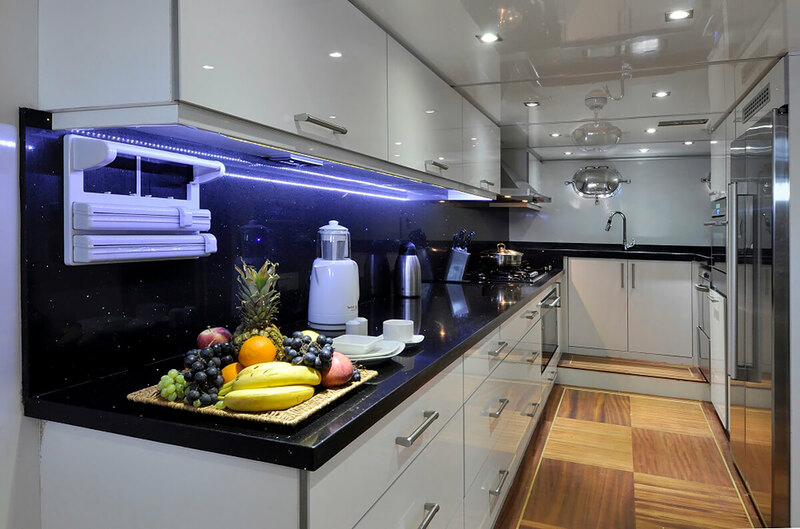 Your personal Chef will take care of your luxury meals, buffet breakfasts, and dinners that will please even the toughest critics. 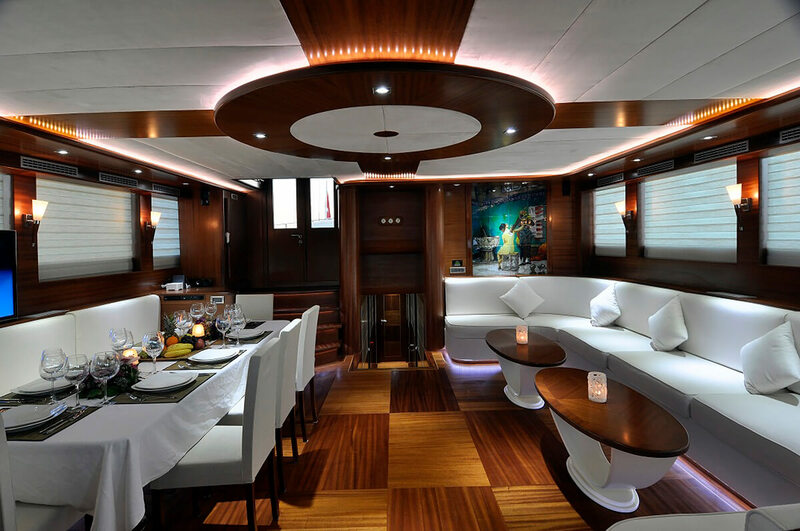 It is also worthy of mentioning that crew on boar provides one of the best high-end services! Their approach will make your cruise special and a memory you will treasure for life. 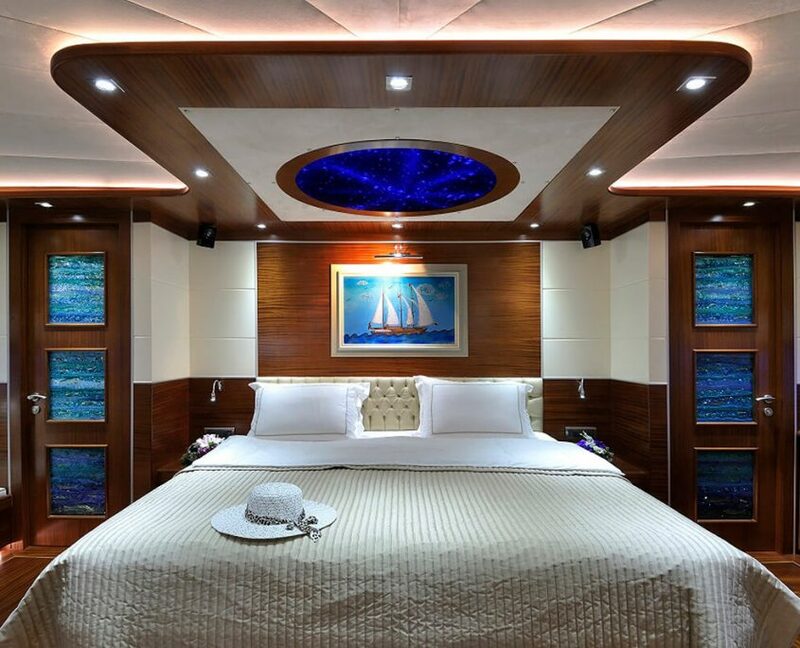 2 Master cabins-20.00 m2 cabin with double bed (205*215 cm). 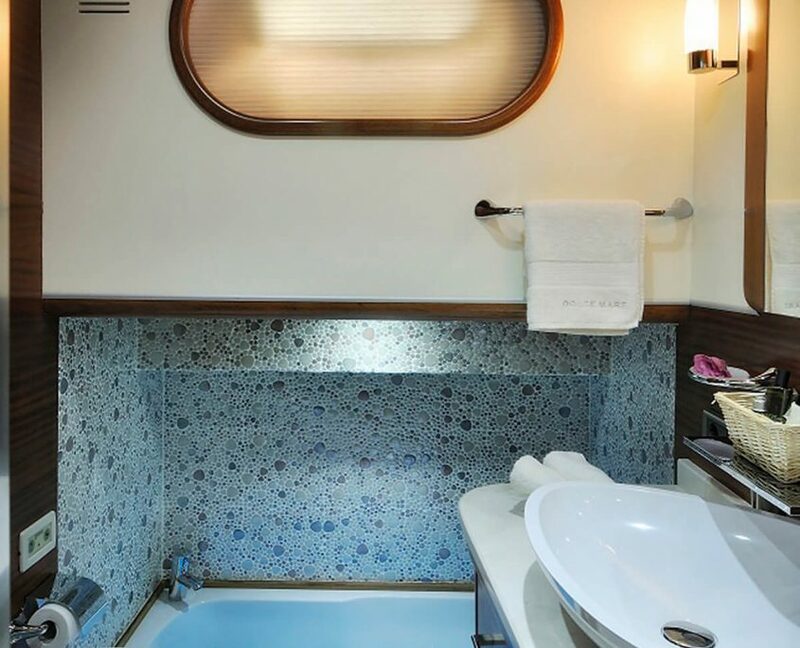 Private bathroom with jacuzzi, shower box, and push-flush toilet. 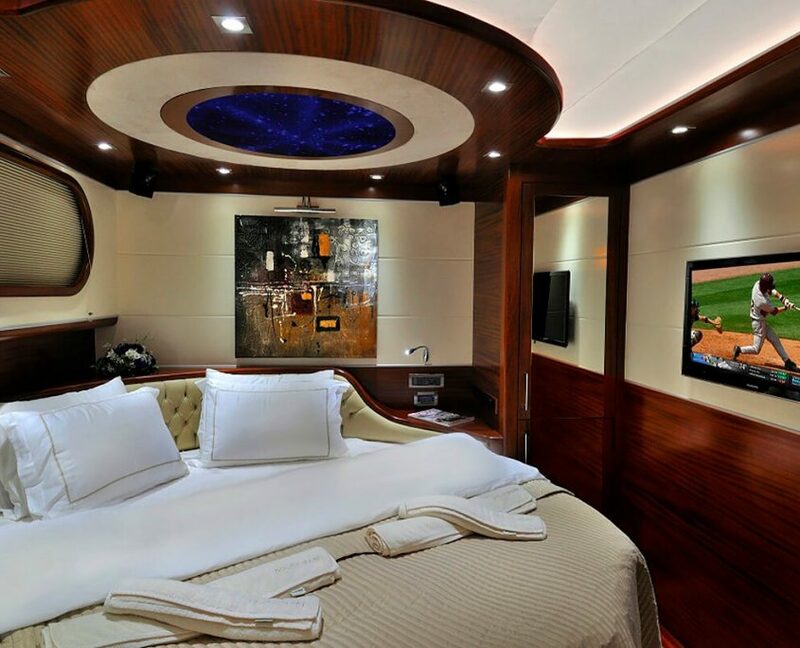 2 Triple cabins-9.50 m2 cabin with double bed (140*200 cm) and single bed (100*210 cm). 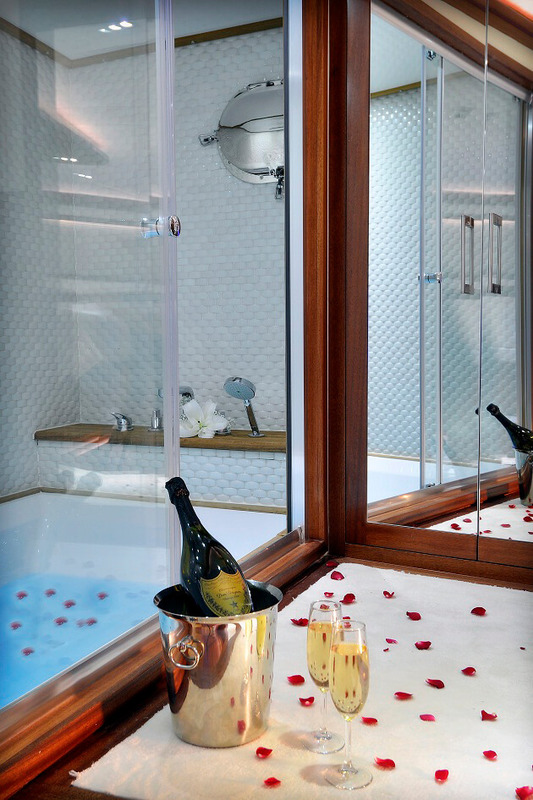 Private bathroom with shower box and push-flush toilet. 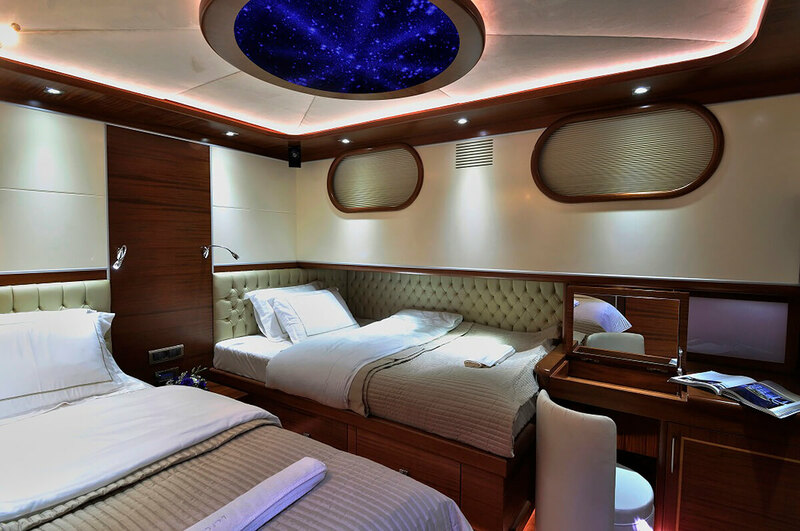 2 Double cabins-9.00 m2 cabin with circle double bed (220*220 cm). 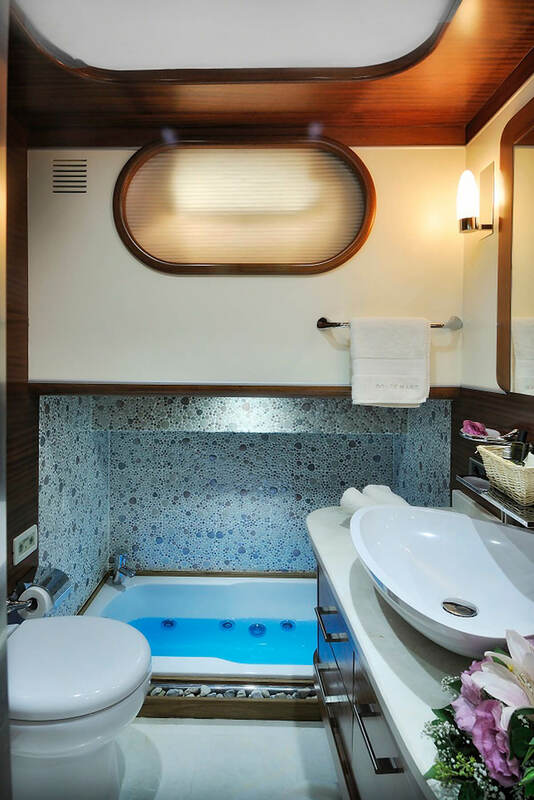 Private bathroom with jacuzzi, shower box, and push-flush toilet. 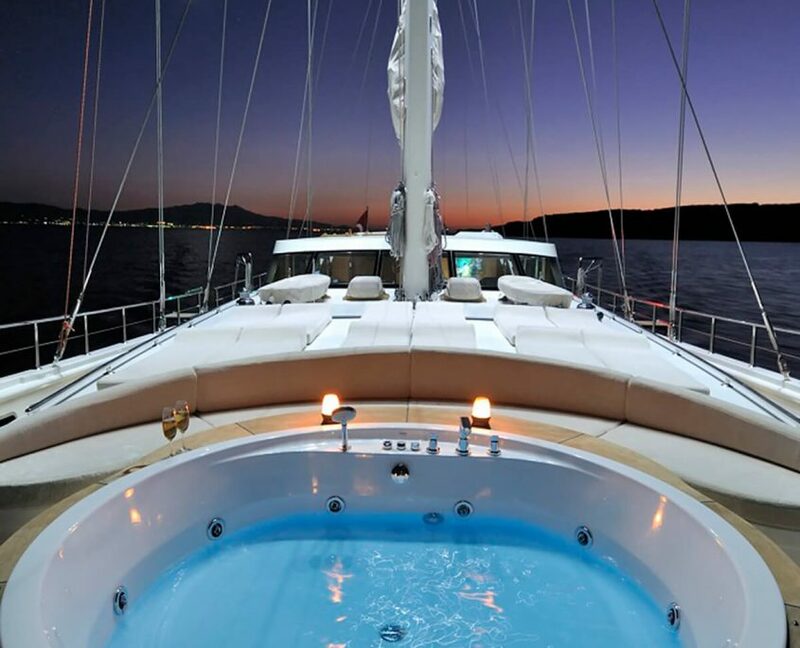 Tender boat: 5 meters, 90 HP, Water skiing: fuel per usage, Wakeboard: fuel per usage, Jet ski 250 €/day + fuel per usage, 1 windsurfer, 2 paddle boards, 1 kayak, 12 sun mattresses, Basic fishing equipment,12 sets of masks, snorkels and flippers, Shower on deck. 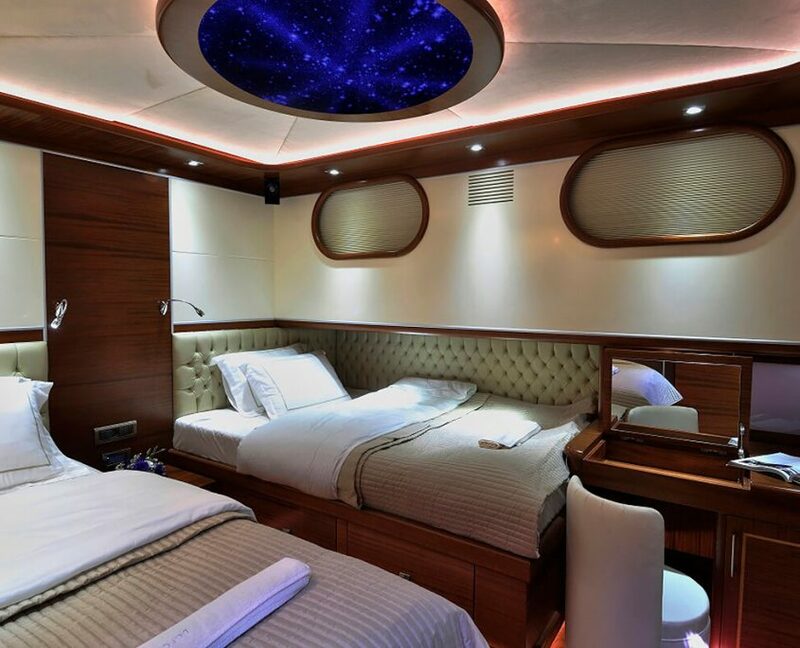 TV with local antenna, DVD player + DVDs, Wi-Fi mobile internet connection – just for Turkish coasts and Turk-cell connectivity, USB connection for multimedia devices, Laptop, Icemaker, Espresso machine, Water maker, Air condition, Full regulation safety equipment, Possibility of eating in a salon in case of bad weather.